Reigning PAPA World Champion Escher Lefkoff and his Dad join us this week to talk some competition pinball. wait? that was on a new twitch channel? darn I missed it! something to watch tonight, next Cheetah! Episode 67 - Everyone Likes Dialed In! Raymond Davidson joins us to talk about the recent Heads-Up Pinball Championship. -How Do You Get 20 Ghosts? Guys. How you’re knocking on Lost World. I have to tell ya. 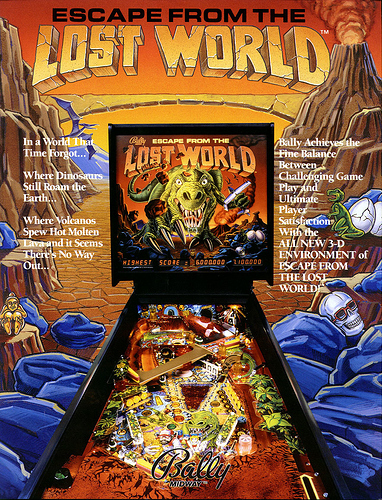 Lost World is an ACE game. Surprised how awesome the playfield layout is. With few modes (good thing), where some of them are challanging to complete. High re-play value. By far the best Sega era game I have every played. Top 5 DE/Sega for sure. The ball grap mech being a little shaky and tedious. The 4-ball 3-lock multiball (WTF). The lack of grace time for jackpots and mode goals. The potential one-shot-all-day kind of a game. And the poor choreography, information and player feedback. It is a truly stunning game. Hey @Gizmonic, what website was doing the new SB-300 Stern sound card reproduction? thanks! New Replacement MPUs are now Shipping! Comes plug and play ready with Game ROMs and CPU installed. Only wish for two upgrades for the Bally backbox rectifier board. Instead of just a 100% carbon copy. First. Redesign to seal of everything mains power. Hugh design flaw by Bally to have mains power fuse clips exposed like that. And sitting so close to low voltage parts you have to troubleshoot and work on. Second. Install heavy duty screw down clips for GI lightning. As supplement to the .156 connectors. The Pinball Princess Steph Guida joins us this week to talk some pinball. Inland Empire’s Karl DeAngelo joins us this week to talk some pinball. Seriously been missing you guys. Welcome back!